Just as it sounds, a big-picture thinker is someone who tends to notice the whole story rather than the individual components of the story. That doesn’t mean they can’t or don’t notice details, just that their tendency and passion is about the whole story. Big-picture thinkers might think of themselves as strategic, systems, or visual thinkers; usually have a good dose of “right-brain” thinking (although they might have a lot of “left brain” thinking, too! ); and if you’re familiar with the Myers-Briggs personality inventory, lean towards N. You can learn more about how you see the big-picture by taking the Self-Assessment. What interests you about big-picture thinkers? Well, first – I am one, and I believe that the world needs the perspective and contribution of people who see the big picture. A lot of suffering is created when there is a consistent or exclusive focus on fragments. When we view the world in a way that includes the whole, that perspective allows us to take actions that influence and optimize the core of how a system works. When the core changes, the impact ripples throughout the whole system. An obstacle that big-picture thinkers come up against is well-described in one of the attributes of the Myers-Briggs N: “Sometimes I think so much about new possibilities that I never look at how to make them a reality.” That’s the key phrase that my coaching is based on. I’m all about helping big-picture thinkers focus on the possibility that they want to bring into the world, and the action they can take to do so. So if we’re talking about thinking, why is there a focus on grounding in the body, or saying the things that matter to you? Thinking is necessary and important and…like any other human capability, it has a limit when it is used in isolation. If you are stuck or looking to move to the next stage of growth, it’s typical to want to use more of whatever capacity you already have. However, the thinking that is keeping you at your current level of development is probably not going to magically create the thinking or the action that you need to move to the next level. Most of my clients are pretty well-developed cognitively, and have probably done quite a lot of thinking about the situation in which they find themselves. They are open to experimenting with how different capabilities give them access to effective action, and even clearer and more brilliant thinking. Grounding in the body and being able to articulate what matters to you are ways of channeling and clarifying your thinking, and tapping into the capabilities that put thinking into action. I coach people at the intersection of life and work. My philosophy is that the self is the foundation for the business, and so my coaching addresses both the self and the business. Because I have strong backgrounds in both personal development and business, I am equally comfortable with conversations ranging from personality and feelings to positioning strategy and profits. This provides me with a lot of strength in assessing where you can get the most leverage to move forward. Whatever is standing in your way of bringing your concepts to the world is the opening into the work that we will do together. I sometimes think of what I do as “life coaching within the context of business,” because the issues that are keeping you from moving forward in your business or career are most likely affecting the rest of your life in a similar way. I aim to get to an understanding of the core “thread” of your gifts and challenges that will unlock potential for you. How can I determine if your coaching is a fit for me? The best way to determine if it’s a fit is to schedule a complimentary 30-45 minute discussion with me. This discussion will allow me to hear why you are considering working with a coach and what you hope to gain from coaching, and will allow you ask questions about my approach to coaching and to experience my style of working with my clients. It’s usually pretty clear to both of us after this interaction whether we are a good fit for working together. When will I see results from our coaching engagement? You’ll probably get a great deal of insight about yourself from engaging in the Assessment Session, a 60-90 minute session that begins the coaching engagement. Somewhere around the three-month mark, most clients experience what I call “the turn,” a point at which people begin to more deeply understand and embody what we’ve been talking about and practicing. In general, the more willing you are to try new things, practice, and take ownership of your learning, the more likely it is that you will have results that you find satisfying. It takes time to practice and integrate new perspectives and behaviors into your life so that they stay with you long after the coaching engagement has ended. Clients typically work with me for 6-18 months, depending on the scope of the change they would like to make. Reassessment is built into every engagement so that we are periodically revisiting our initial plan and gauging what progress has been made. When you feel you have what you need, then we complete the engagement. Why is the initial coaching engagement commitment six months? I’ve found that six months is an optimal amount of time to learn, practice, and integrate new skills so that you get a lasting return on your investment. An engagement that lasts less than six months decreases the likelihood that you’ll meet your goals in a sustainable way. I’ve also found that it’s important to commit to a period of time in which you are willing to hold space open for new learning and action. Committing to six months makes it more likely that you will hold yourself accountable to doing the work needed to move toward your intentions. That being said, I have no interest in holding anyone hostage — coaching only works for people who want to be coached. If you find that you have what you need sooner than six months, you are welcome to discontinue the engagement at the end of any month. I work with clients in person, by Skype, or by phone. Clients who live or work in the New York metropolitan area come to see me in my Montclair, NJ office, or I can travel to work with you in NYC. I work with clients anywhere in the U.S., and have had clients from as far away as London and China. You have a fantastic, creative mind – are you tapping into its full capacity? 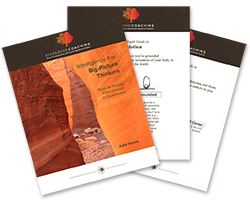 Enter your name + email to receive Intelligence for Big-Picture Thinkers: Tools for Moving from Concept to Contribution. Using targeted examples, exercises, and practices, this 5-session exploration helps you to learn how you can bring your ideas into the world more powerfully. You’ll also receive the latest intelligence from my monthly newsletter.